Meats are the great source of protein. According to United States Department of Agriculture (USDA), a piece of 100 grams’ meat contains 26 grams of protein! So, it becomes a part of a dish of a healthy meal. Cooking a healthy dish of meat is an art. To make your cooking more delicious, you need to slice your meat nicely. If you are struggling with finding the best knife for cutting meat, then we are here to make your job hundred times easier! When people want to do some shopping for cutlery, it makes themselves confused easily. There are huge varieties of knives available for cutting meat. But, which one is perfect for you? Tough question, huh? Well, let’s make the tough question as easy as pie! You know, there are different types of meat cutting knives. Each of them is specialized in their sector. To select a perfect knife, you need a proper knowledge about the meat knives. In this section, I am going to inform you about different types of meat knives. Chef's knives are the all-purpose knife. These knives are primarily designed for cutting and slicing the large pieces of meats and bones. These knives are mainly originated from Germany and France. These knives are made of from plenty of materials such ceramic, carbon steel etc. But most of them are made of stainless steel. You will find these knives with different blade sizes. It can range from 6 to 14 inches. The most used size is eight inches and the professional users of the 10 inches’ unit. The tip of chef’s knives is pointed and the cutting edge is curved. Sashimi knives or Yanagibas are traditional Japanese slicing knives. Sashimi knives are popular for the most sharpened edge. These knives are most preferable among the Japanese Sushi chefs. They use it to slice the fishes of sushi. However, the western cooks recommend these knives for barbecue carving. ​The utility knives are those knives which are highly versatile, multi-functional knives with an average price range. These knives are capable of doing any cutting chores in your kitchen. A good utility knife can slice from your yesterday's grilled meat to the vegetables like cucumbers, tomatoes etc. Gyutou is a Japanese knife. The Japanese word “Gyuto” (牛刀 ぎゅうとう） gyūtō), means 'beef knife'. It is the Japanese version of Chef’s knife. Gyutou is very versatile. Professional cooks use these knives not only for cutting meat but also slicing the fishes and vegetables too. These knives are most famous for their weight. These knives are lightweight and their thin blade can maintain a long edge retention.5. Carving Knives:The carving knives are specialized for carving a roast, a turkey, something. Both the carving knife and slicing knife are used for slicing meats and vegetables. There is very little difference between these knives. Here we have discussed the main differences between the slicing and carving knife. Slicing knives are longer and more narrow than the carving knives. Slicing knives contain serrated or straight edges and rounded or blunted tips. These tips will give you a better and improved meat separation experience. A slicing knife will help you to precisely cut your meats into thinner and smaller parts. Slicing knives are perfect for slicing pork, venison, roasts, fish and barbecued beef. The carving knife has very long and narrow blades. The ending point of the blade is sharper. The blade is about 8 to 15 inches in length. They are used to cut meats like poultry, hams, roasts etc. Often they are used in conjunction with a fork. The carving knives are wider and shorter than the slicing knives. Hope that now you have a clear concept of different types of meat knives. Now you can visit a retailer shop and online shop to find your desired knife. However, to make your selection process a little bit easier, we have already researched the available meat knives on the market. A boning knife is used for removing meat from the bone. These knives have a very thin blade. This blade allows you to go under the bone so that you can remove the maximum amount of meat from the bone. Among all of the meat cutting knives, we have selected J.A. Henckels International CLASSIC 5.5" Boning Knife and DALSTRONG Boning Knife - Shogun Series - VG10 - 6" (152mm) as the best of the best. A short description of these two knives is given below. This Spanish made boning knife contains a very sharp and thin 5.5" blade. This blade is made of stainless steel. It can easily remove the meats from fish, poultry and other white meats. Its flexible blade is perfect for the large bones. This unit comes with a black plastic handle. It provides a very comfortable feel to grip. Its narrow handle makes it an ideal knife for the people with smaller hands. Its sharped blade, incredibly sturdy tip and comfortable handle make it one of the best knife for cutting meat bones. The DALSTRONG Boning Knife - Shogun Series - VG10 - 6" (152mm) is a revolutionary knife of Dalstrong brand. This knife is capable of providing the best filleting, skinning, trimming and butterflying experience to you. Its blade is made of German high-carbon steel. It is ideal for beef, pork and wild game. 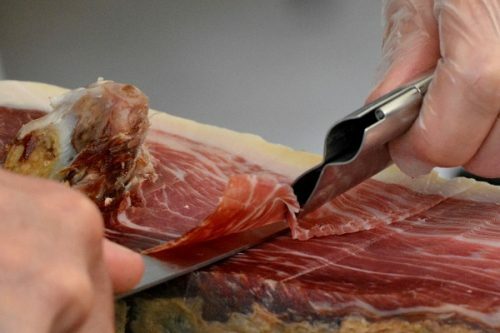 The blade shape will allow you to easily remove the meats from the bone joints. In fact, its narrow blade also can also efficiently glide along the contours of the bone. It makes the meat removing job very easier. Further, the tapered tip makes it easier to work on difficult to reach areas. The edge is handcrafted to 16-18 degrees per side. That means it can maintain a proper balance between blade sharpness and maximum resilience. Its strong and polished design makes it more flexible, improved hardness and marginal slicing resistance. Its handle is made from black Pakka. It has three rivets to make the blade more secure. further, the unique texture of the handle enables the tighter grip and better control. This knife is a perfect choice for the full-time cooks. Choosing the right knife is very important. 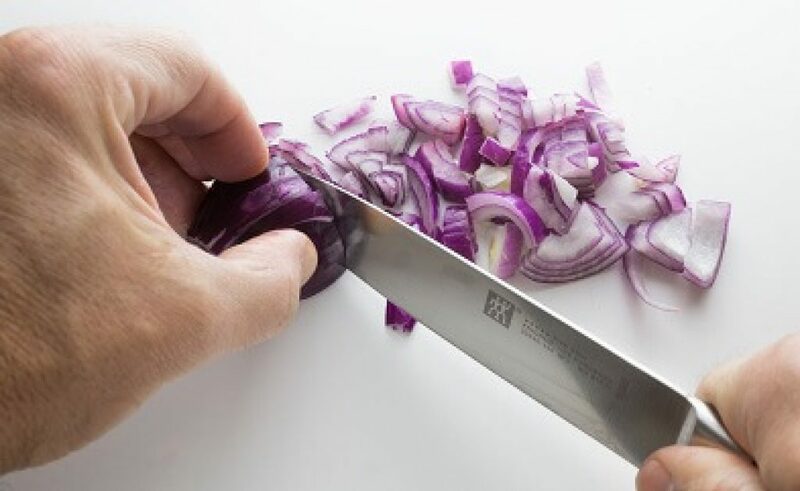 You should not use a bread knife to slice an onion or the dinner rolls with a paring knife. So, what is the best knife for trimming meat? Well, after using a lot of knives, we have selected the Global G-12 - 6 1/2 inch, 16cm Meat Cleaver as the best knife for trimming meat. Wonder why? Let’s make it clear. The Global G-12 meat cleaver is the best solution for them, who needs a gorgeous industrial looked knife to trim their meat. The famous knife manufacturer brand ‘Global’ make this knife totally wood free. This knife is made of metal. Don’t think that the metal handle will be slippery or difficult to grip. Global has made a beautiful and ergonomic metal design for the handle. This Global G-12 meat cleaver is smaller than the other G-series Global knives. This feature makes it perfect for the people with smaller hands. This product comes with a full-tang construction. Its blade is stamped by hand at a 15-degree angle. Further, it’s ergonomic design makes it easier to trim the meat. As the trimming is a continuous process, so the weight of your tool is a great factor. However, this knife weighs only 1.3 pounds. With all of these amazing features, we have declared the Global G-12 - 6 1/2 inch, 16cm Meat Cleaver as the best knife for trimming meat. Like the most other knives, the demand for BBQ knives is increasing most rapidly. Whether you are trimming ribs, chopping pulled pork or sliced brisket, a good quality knife is absolutely essential for your barbecue cooking. That’s why you should not choose a general purpose knife for your barbecue cooking. However, after researching the current knife market, we have selected the Mercer Culinary Millennia 11-Inch Granton Slicer Knife as the best knife for BBQ. The 11 inches Mercer Culinary Millennia is a great tool if you are going to cut large turkeys, briskets and other large meats for BBQ. It is a very high-quality and razor-sharp knife. This product is made of high carbon stainless German cutlery steel. So, there is nothing to worry about rust, corrosion or discoloration. Further, its taper ground edge provides a great balance for easier honing. This product comes with short bolster. This feature makes it ideal for cutting large pieces of meat. This Mercer product also allows fast sharpening. The handle of this knife has a triple riveted, ergonomic and patented Delrin handle design. Its full tang runs give the proper handling balance. For the secure grip, the manufacturer company provides rounded spine with this product. All of these features with sturdy build-quality and Delrin handle makes it more secure while cutting. The National Sanitary Foundation (NSF) certified its handle as the most secure handle. The 7 inches DALSTRONG Cleaver is a versatile knife. It works well with almost every kitchen ingredient. It is capable of cutting from the vegetables to meats and bones. This product comes with a very sharp blade. This blade is made of high-carbon German steel. Its hand polished edge is 18 degrees per side. It is very lightweight and well balanced to handle. Its handle is made of luxurious black pakka wood. It is fastened with three metal rivets. These metal rivets ensure that the handle won’t loosen up from your hand. Further, the build quality and tall blade make it very easier to cut almost anything in your kitchen. So, beware of your fingers! The Victorinox 12 Inch Fibrox Pro Slicing Knife with Granton Blade is the most favorable and highly recommended tool for the professional chefs because of its superior performance. This product comes with a razor shaped blade to provide the best cutting experience to its users. This blade is made of high-carbon stainless steel. This steel makes this product highly flexible. Its Granton blade is able to create air pockets of its own. These air pockets prevent the foods from sticking to the blade. If the foods are stacked with the knife, it reduces the usability of that knife. Further, it requires more time to clean and it is really disturbing and time-consuming. Its plastic knob is very easier to handle. Even the novice users will also find no difficulties while using this knife. The blade is ice tempered. So, the edge of the blade will remain sharp for a longer period. Lifetime warranty for any manufacturer defects. According to the Organisation ﻿for Economic Co-operation and Development (OECD)﻿﻿​ the citizens of United States consumes about 11,863.88 thousand tons of meat only in 2016. This amount increased to 12,043.76 just in 2017. This huge amount of meat consumption proves how much meat lovers live in United States. So, the meat lovers of the United States always pay an extra concentration on the meat cooking process. ​A meat chef is similar to a painter. Without a paintbrush, no one can create a masterpiece. So, how a chef can make delicious meat dishes without a knife? It is not possible. 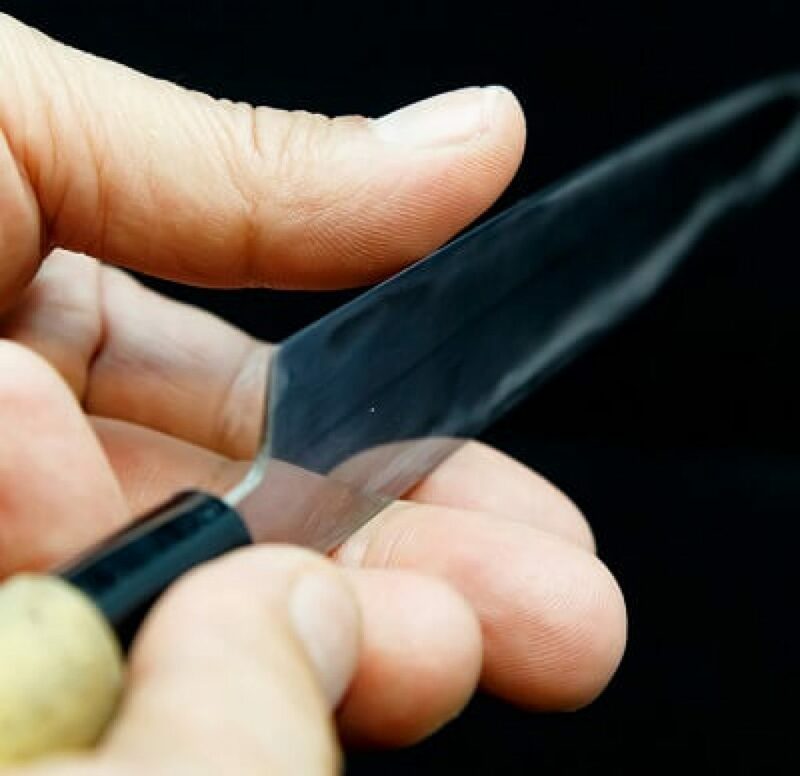 Every chef has their personal preferences for their knife.The professional chefs know a lot about their required knife and they consider few important facts while buying their knives. But what about the normal citizens like you and me? How do we choose the best knife for us? Well, the solution is here. 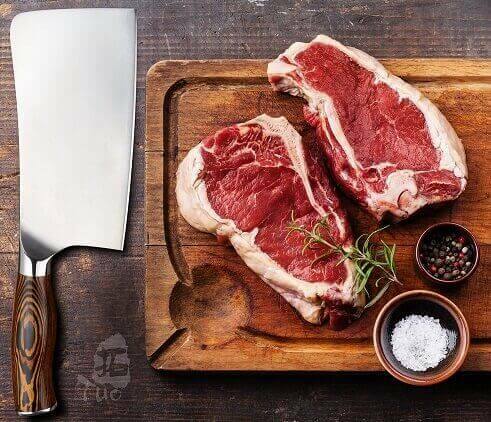 In this article, I will try to inform you about all of the factors to choose the best meat cutter knife.There are lots of meat and bone cutting knives. These knives are used to cut the meats, bones, removing meats from bones of poultry, hams, roasts and other large cooked meats. There are few specialized knives to complete these tasks efficiently. The meat carving knives and the boning knives are the most popular among them. Let’s talk about the important facts to consider while buying these knives. Choosing the perfect blade is not that easy. A strong and sturdy blade is mandatory to cut meats and bones. But what about when you are going to slice the meats? You will need a thick blade obviously. So, what is our overall requirement? We will need a sturdy and thick blade to do all of our meat related kitchen chores. But the combination of these two things do not go hand in hand. So you have to buy the best knife where you will get the maximum combinations.While buying a knife for cutting meat, I will never recommend to buy the stainless steel made knives. These knives are not as sturdy as you need. Instead of these stainless steel made knives, the high carbon made knives will be better choice. However, if you like to work with the stainless steel made knives, you can definitely go for them. The high quality stainless steel made knives are stronger quite stronger. So, if you are desperate to use those stainless steel made knives, always choose the one with higher quality. It may cost few more but these will be helpful for you. On the other hand, I will suggest you to use the high-carbon steel or high-carbon stainless steel made knives. However, if your chosen knife meets surgical grade or 18/10 grade, you can surely go for it. Sharpness indicates the overall quality of a knife. A sharper knife is not only time saver but also they are more efficient than the dull knives. A sharper knife can cut the raw meat or bones faster. Even, there is almost no possibility to slip those knives. You also need to use less pressure while using the sharper knives. Besides choosing a sharper knife, you also consider the lifetime of this sharpness. There are few knives, which remains sharpen for a long time. But they are very difficult to sharp while they become dull. On the contrary, you can choose a knife with average sharpness lifetime. You can sharp them easily with the knife sharpener or whetstones’. However, if you love to buy your knife online, there is no possibility to check the sharpness. So, I will suggest you to buy a knife directly from a retailer store near to your residence or office. But, if you are out of time or extremely busy with your life, then you can definitely for online stores. But, before ordering a knife, spend some time by researching about that. Try to read all of the positive and negative reviews about this. Further you can also seek help from the popular knife forum sites. They will provide an honest review about your chosen knife. The pointed or rounded knives have few great advantages. But most of the people are not careful about it. For example, while you have to keep a mark on the meat or bone, you will need a pointed tip. Again, if you want to serve the fried pieces of turkey, chicken, ham, or roast directly to the guest’s plate in a barbecue party, there are no alternative of a pointed knife. You may choose a slicer to do this job, but this is only perfect for boneless chicken. A carving knife with rounded or pointed tip is always the crown owner for the meat with bones.4. Balanced Weight:Weight is a big part of a meat or bone cutter knife. While cutting the harder bones, you must keep control over the whole knife. But there are no “correct” weight. The correct weight varies from person to person. It is just a matter of personal preference. So, it will be another great problem if you buy knives from online. You cannot check whether your chosen knife is fit for you or not. The retailer stores will be really helpful to solve this kind of problems. The handle is an important part of a knife. You have to control the whole knife via the handle. So, this handle must be well fitted and balanced with your hand. The usefulness of a knife is mostly depending on its handle material. The knives with plastic or stainless steel made handle is the worst choice for a meat or bone cutter knife. They are too much slippery. The wooden handle is the best choice for the knives. Wood is less slippery and fits with hand properly. However, this handle comfortness depends on your hands shape, size, strength and your personal preferences. There are so many ways to screw up your meat. If you do not like to do so, you must buy one of these knife for cutting vegetable and raw meat. Only the best knives can give you the mouth-watering taste of meat. Hope that we can inform you about the best knives for trimming meat. Further, you can choose any of our top 6 knives for cutting. All of these six knives are highly effective in their specialized sector. If this article helps you, thank us later and buy a perfect knife right now. Enjoy your trimmed meat every day!